the 19th century. A band-stand, which once stood here, witnessed concerts of a military band whose bandleader was Franz Lehár Senior. Nowadays, the stand’s copy can be found on the Europe Square. 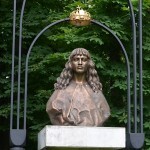 A statue of the Hungarian and Czech king, Ladislaus the Posthumous (Czech: Ladislav Pohrobek Habsburský) is displayed as a reminder of his birth to Emperor Albert II and Elizabeth of Luxembourg (he was born 4 months after his father’s death) which took place in the Komárno fortress in 1440. He died at the age of 17 in Prague most likely due to leukemia despite rumors that he was poisoned.